The Kawar are a tribal people who live in India, Bangladesh and Nepal. Some of the Kawar people have become so absorbed by the cultures of the surrounding peoples that they are no longer considered to be true Kawar. Some have completely lost their language and former culture and now speak a different dialect. It is possible that in the future that the Kawar will no longer be a distinct people in many of the areas where they now live. The traditional occupation of Kawar men has been as soldiers for the rulers of Bangladesh and India. Sometimes they fought for and sometimes against the British Raj. They have a reputation of being fierce, disciplined warriors. Most of the Kawar people live in east central India. A smaller number reside in Nepal and Bangladesh. Most Bangladeshi Kawar live in the state of Dhaka. Although the Kawar consider military service their traditional occupation, most have given up military life and have become farmers or laborers. Kawar farmers are being encouraged to adopt a more settled type of farming. However, those in the hills can still depend on slash and burn cultivation as well as gathering forest products for survival. A major source of their cash earnings comes from selling firewood that is collected from the forest. The lower classes also weave ropes and make sleeping cots to sell in the markets. The Kawar have several endogamous divisions (only allow marriage within their own groups). These divisions are further divided into a number of exogamous sects called goti or clans. The goti are "totemistic," which means they use symbols of plants and animals to represent their group. A group totem represents their bond of unity and is often considered the ancestor or brother of the group's members. Marriages within the same clan are unacceptable. A marriage begins with negotiations, usually initiated by the boy's father. Polygamy is permitted, but not common. The staple foods of the Kawar are rice, vegetables, fruit, and dairy products. They do not eat beef, pork, or any other foods that are considered unclean by Hindus. However, they enjoy drinking rice-beer and other alcoholic beverages. 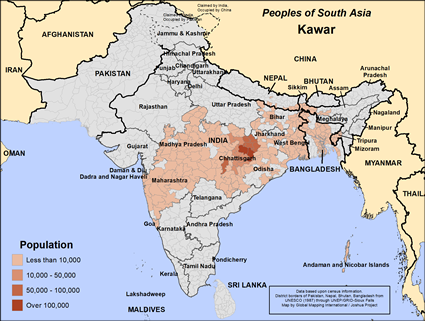 The Kawar are almost exclusively Hindu. They follow Hindu practices, but still mix their traditional folk beliefs with their practice of Hinduism. Like most Hindus, they will worship the god or goddess that they believe will help them with their present circumstances. Hindus believe that by performing rituals and good works that they will attain moksha or freedom from the endless cycle of birth, death and rebirth. The Kawar visit Hindu temples and offer prayers, food, flowers, and incense to their gods. There are many forms of Hinduism, each with its own deities and beliefs. The main yearly holidays of the Kawar people are Holi, the festival of colors, Diwali, the festival of lights, Navratri, the celebration of autumn, and Rama Navami, Rama's birthday. Medical facilities among the Kawar are inadequate. Even where the medical personnel are available, medicines, instruments, and essential provisions for the patients are extremely lacking. Adequate medical equipment and staff are needed, especially for the control of sexually transmitted diseases, leprosy, and other communicable diseases. There are only a few known Kawar believers. There is a great need for Christian doctors, nurses, teachers and agricultural experts. * Pray for the Holy Spirit to give the Kawar people a hunger for spiritual truth that will only be satisfied by Jesus Christ. 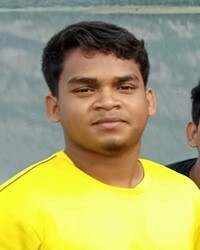 * Pray for the Lord to thrust out Holy Spirit led workers to the Kawar people in Bangladesh. * Pray for these workers to have the cultural sensitivity to go to Kawar leaders as Christ's ambassadors. * Pray for a church planting movement to thrive among the Kawar people. https://joshuaproject.net/people_groups/17122/NPView Kawar in all countries.